I’ll be doing a name change when I do the Naturalization Oath ceremony later in the week. I didn’t have to pay any fees to do the name change. It’s free as long as you don’t try to use names such as Barack Obama, Brad Pitt, Airbus Jet or Kick U Down. Basically insults, violence or famous people/companies. In the N400 Application for Citizenship forms, there is a section that asks if you want to change names. It’s that easy. You give the names that you want to use and at the naturalization ceremony you’ll see a judge who will do the name change and the Oath ceremony. The thing with names is the US government takes the last name on your passport abd that’s the name that will appear on the Social Security card. It’s also the name you’ll be identified with. In my case I have 4 names on my Kenyan passport. The last name is not my name. It’s my dad’s name. The third name is the name I’ve used all my life. When I got here, the third name disappeared due to the way the system operates. Their format is Last Name, First Name and middle initial. I acquired a new identity overnight. At my places of work before I joined the Air Force I had to get used to the new name. I would forget sometimes when colleagues referred me by that name. When I joined the military, the name they use on uniforms and all identifications is the last name. It’s not easy to pronounce and hence the variations I get when people try to pronounce it are so varied. All that is about to change. I’m getting my identity back. I’ll have a lot to change. From government offices, to military paperwork, uniforms and a whole lot more. It’ll probably cost quite a bit to do all that it will be well worth it. This entry was posted in Uncategorized and tagged Citizenship, Ganja, N-400, Name Change on February 29, 2016 by Guriix. I just completed my citizenship test. I put in my paperwork in December before I left Houston for my first base. The N-400 is a looong USCIS application booklet or form with 21 pages. In addition to that I attached form N-426, Request for Certification of Military or Naval Service. Signed by my leadership in tech school. The Dallas USCIS military liaison was very helpful in providing the information I needed to submit. I was supposed to complete the process during Basic Military Training (BMT) but obviously that didn’t happen, same with tech school. I sent in the paperwork to Nebraska Service Center (NSC) by courier and i confirmed they had received it the following day. A day later NSC wrote and informed me that I needed to have my fingerprints taken at any USCIS Application Support Center (ASC). I stopped in Charleston, West Virginia and did them with no hustle. I proceeded with my journey east. I contacted them a couple of weeks later and they told me they were in the process of doing background checks. In the meantime as I was in-processing into my new base the Force Support Squadron aka FSS asked for my alien number on my green card so that they could request Nebraska to transfer my file to the state USCIS office. I followed up with the military liaison 2 weeks later and they confirmed my file had been transferred to the local office. They would contact me if they didn’t need to do further background checks. 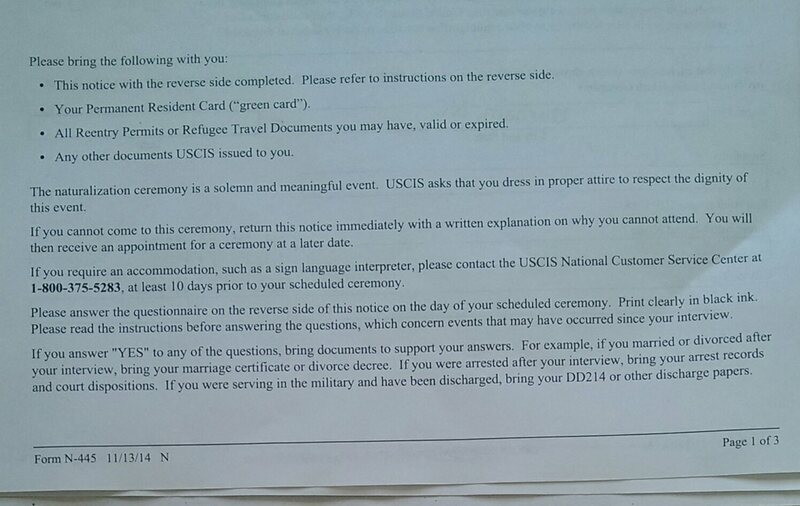 USCIS called a week later and voila the interview date was in my mail. I had a week to prepare. I had a civics study guide to go through. It consists of 100 questions on government and history. I put my time in and was ready for the big day. I made it to my interview and was seated before an immigration officer at my appointed time. He went over the 21 pages of stuff in the application form, asked me 6 questions including who the Governor of the state is. You have to answer 6 of 10 questions. He stopped after the first 6. He asked me to read and write an English phrase and I was done. I’d passed. I’m changing a name so will have to see a judge for that before the naturalization ceremony in a couple of weeks. I look forward to the day so that I can get the reunification paperwork rolling for missus. 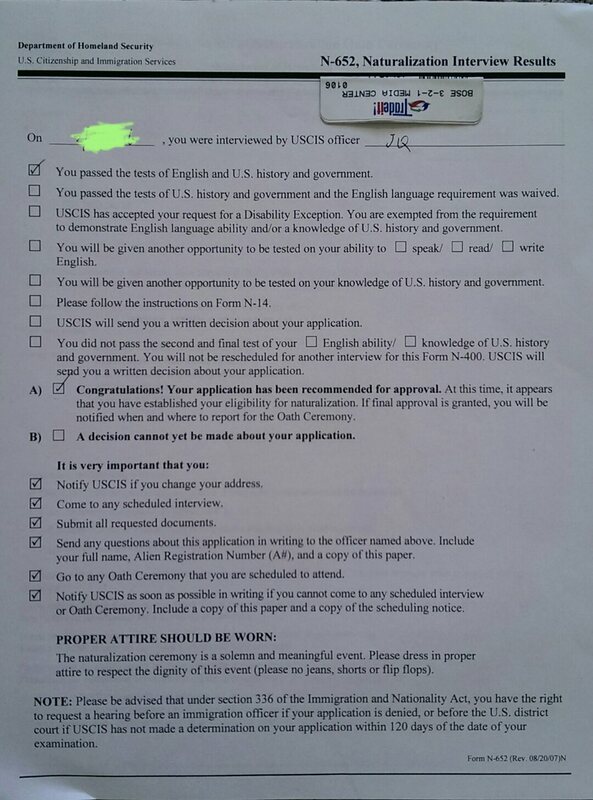 This entry was posted in Uncategorized and tagged Civic test, N-400, Naturalization, Nebraska Service Center, US Citizenship Test on February 11, 2016 by Guriix.